Today, as usual, I will walk with the Hohokam people. Well, where they lived - the Hohokam people left the Phoenix area hundreds of years ago. They left behind their adobe buildings, of which all that remains is what has been preserved in places like Pueblo Grande, at 44th Street and Washington. They also left behind gigantic canals, which were still very visible through the 1920s. If you've ever had to learn about them in school, you know about that. 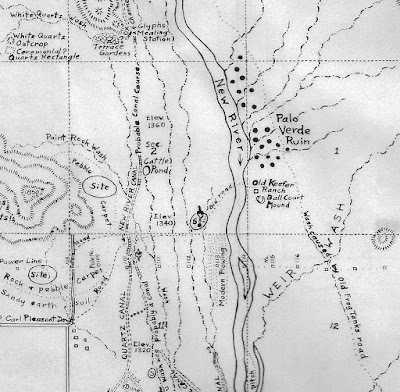 But the Hohokam people didn't just live over by the museum at 44th Street and Washington, they lived all over the Salt River Valley, including where I live, near the McDonald's at 67th Avenue and Peoria. No, there's no museum, or velvet ropes there, but if you walk there you'll be tracing their footsteps. And I'm not trying to be mysterious here, if you walk anywhere in the Salt River Valley, from Tempe to Peoria and far beyond that, you'll be tracing their footsteps. They were there. Even hundreds of years ago the Salt River Valley was a harsh climate. The freeways nowadays may have made the high temperatures as much as ten degrees higher than they were in the time of the Hohokam people, but it was still very hot in the desert. And I often think about these people, who lived along the banks of riparian rivers, which flowed in the winter, and during rains, and dried up at all other times. The rivers nearest to me are the Agua Fria and New River. And yes, there were settlements there. And those people lived there, with no air conditioning, no shoes, and no McDonald's. The next time you walk in the Phoenix area, look around you. Squint your eyes and look past the buildings, the traffic lights, the signs. Look at the mountains and the sky. That's what the Hohokam people saw, from the White Tank Mountains to South Mountain. I can't recommend taking off your shoes, not when it's hot, but if you want to get into the true spirit of it, you should. Thank you for walking with me, and the Hohokam people! Image at the top of this post: Hohokam settlements in Peoria, Arizona, near 74th Avenue and Happy Valley Road.